The Pinewood Derby is an annual Scouting tradition where Cub Scouts of all ages race wooden cars that their dads built. I asked my son what he thought the theme of his car should be, offering LEGO, Mario, or Sonic the Hedgehog as suggestions. He scrunched his brow, pondering the question seriously before smiling and delivering his verdict: "Kirby!" Uh oh, I thought. "Kirby, huh? So... what color should the car be?" But I already knew the answer. He didn't even have to think about it before responding: "Pink!" Front view. 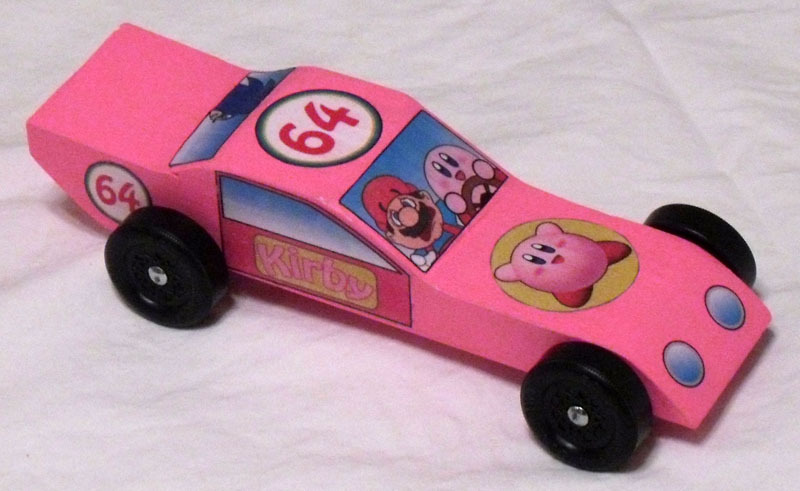 Kirby drives while a terrified Mario rides shotgun. Rear view. Oh lawd, iz dat sum Sonic the Hedgehog? After buying all the necessary tools and deciding on an automotive design, I traced the official Cub Scouts of America car template on our official Cub Scouts of America block of wood (seriously), and began to saw. Miraculously, after about half an hour of back-wrist-and-shoulder-punishing work I had a piece of wood that more or less approximated the template design, with only a small number of giant, disfiguring gashes. Using the largest-grain sandpaper I could find in the garage (I think they actually just stuck some fly paper in a bed of pebbles) I was able to scrub away many of the saw-related imperfections. This took a much longer time than the sawing did, but while my son was nowhere to be found during the entire process (ah, the sweet siren song of the Xbox), my craft-crazy 4-year-old daughter was at my side for the whole ordeal, in rapt attention at every step. She even expressed an interest in having her own car, so I gave her a car-shaped piece of wood I had cut away from my pinewood block. She then grabbed some sandpaper and worked alongside me. Her car. 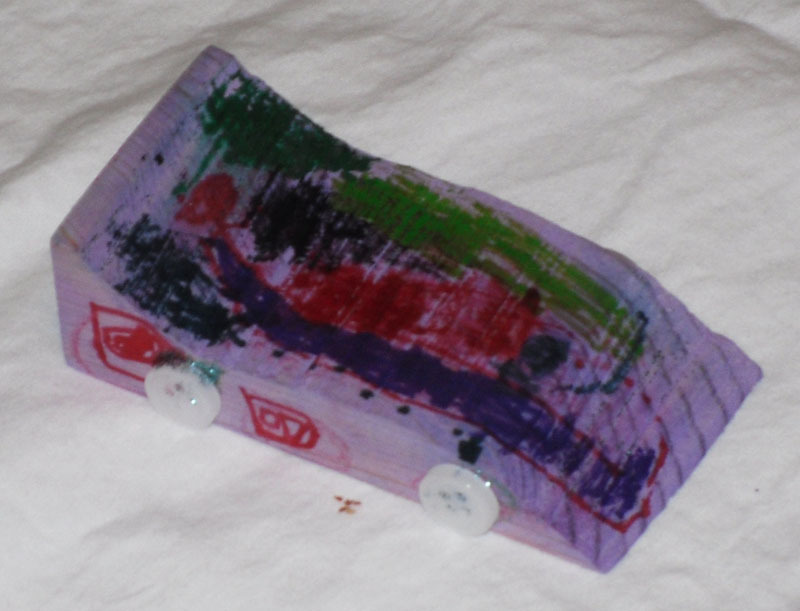 She sanded, painted, and detailed it herself, and then glitter-glued some button wheels on with Mom's help. Later that night, I applied five coats of pink, and let it dry overnight. I spent the next two nights designing custom decals for the car. I wanted to put Kirby, Mario and Sonic in the car, and add some sporty detailing. Charlotte suggested we also number the car, to make it look more official. I chose the number 64, in honor of Nintendo systems past. The decal work was fun but slow, as I have only recently begun teaching myself how to use Photoshop for more than just putting misspelled captions on photographs of cats. The following picture shows some different stages in the development of Mario and Kirby. I used a couple dozen Photoshop "layers" to compose this image, in a process similar to how animators compose frames in hand-drawn cartoons. After completing and printing out the decals, I cut them out and glued them to the car. I also "sealed" the car by putting a couple coats of "ModPodge" on it. This actually resulted in some minor streaking and warping of some of the decals, but this thankfully isn't noticeable when viewed from a distance. I had to coat it with something to make sure the decals stayed on. On the final night, I affixed the axles and wheels. Aligning the wheels turned out to be the most difficult part of the project- and could have been done better by someone who knew what the hell he was doing- but at least the car seems to roll in a straight line. More or less. Soon we will turn the car over to the Scouts for inspection and weigh-in, to ensure it meets Cub Scout regulations, then later this week we will race it. 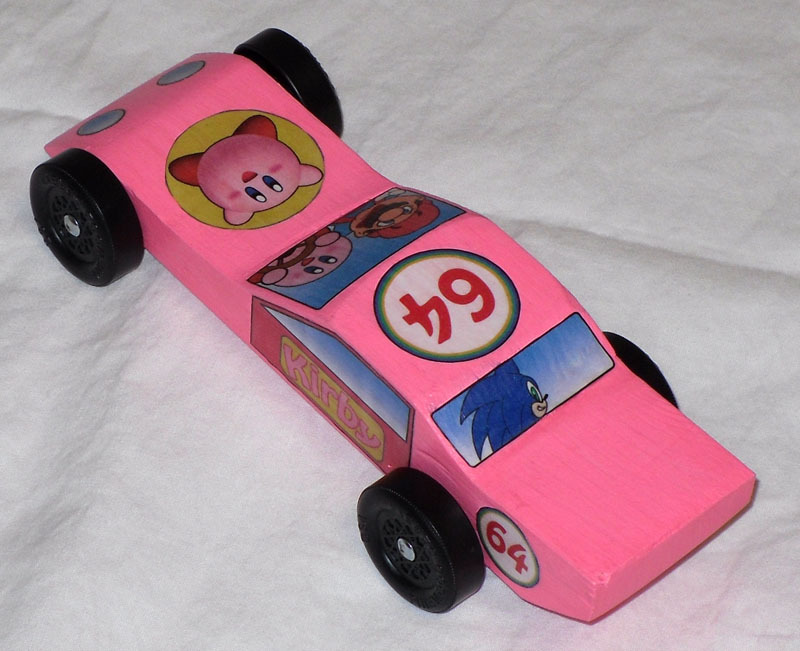 The Kirby car will almost certainly not be the fastest one on the track this weekend, but in my boy's eyes, at least, it will be the coolest.